Kayaking in Waterton Lakes National Park. 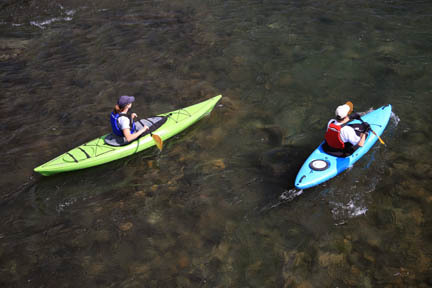 Canoeing, kayaking, and stand-up paddleboarding (SUP) are all popular paddle sports in Waterton Lakes National Park, but there are no rentals available in the townsite. Instead, head 16 kilometers (10 miles)along the Akamina Parkway to Cameron Lake, where Cameron Lake Boat Rentals (403/859-2396) is open mid-June to mid-September daily 9 a.m. to 7:30 p.m. Canoes, kayaks, and paddleboats are $15 per hour for one person or $20 for two people. Although windsurfing has decreased in popularity over the last couple of decades, winds of up to 70 kph (45 mph) still attract hard-core surfers to Waterton Lakes throughout summer and into fall. The winds are predominantly south to north, providing fast runs across Upper Waterton Lake from the beach at Cameron Bay. The lake is deep, keeping the water temperature low and making a wet suit necessary. Read the warning signs at the beach before heading out.